We typically spend the day of the openings of my Principle Gallery shows going to some of the museums in Washington. There is a treasure trove of art and history available within a relatively small area. This year we finally made it to the Freer Gallery of Art in order to see the Peacock Room which was created by James MacNeill Whistler for a home in London around 1876. As you can see from the photo above, it is an opulent space decorated in an Anglo-Japanese style. It is pretty striking with it’s darkly rich colors and its eclectic collection of pottery adorning its shelves. 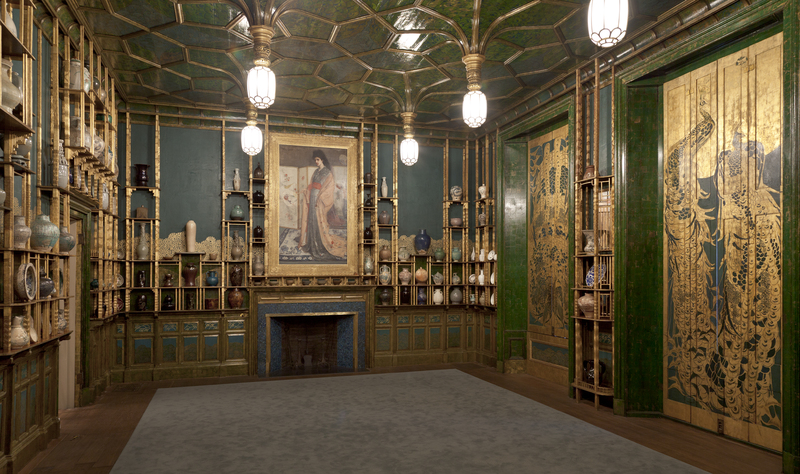 Originally, Whistler stepped in at the last minute to finish the room after its true creator fell ill. Whistler immediately took off on his own vision for the room, changing colors and embellishing to suit his taste. The resulting room infuriated the British shipping magnate who owned the home and this set off a long and bitter dispute between Whistler and him. Nearly 30 years later, American industrialist Charles Lang Freer obtained the Whistler painting that had formerly hung over the fireplace of the Peacock Room then purchased the entire room from the estate of the now deceased shipping magnate. Freer had it installed in his Detroit mansion and when he died in 1919 it was moved to its present home which bears his name. If you ever get a chance try to make it to the Freer to see the Peacock Room. It’s a wonderful piece of art history plus you get to explore one of the less crowded museum complexes in Washington. 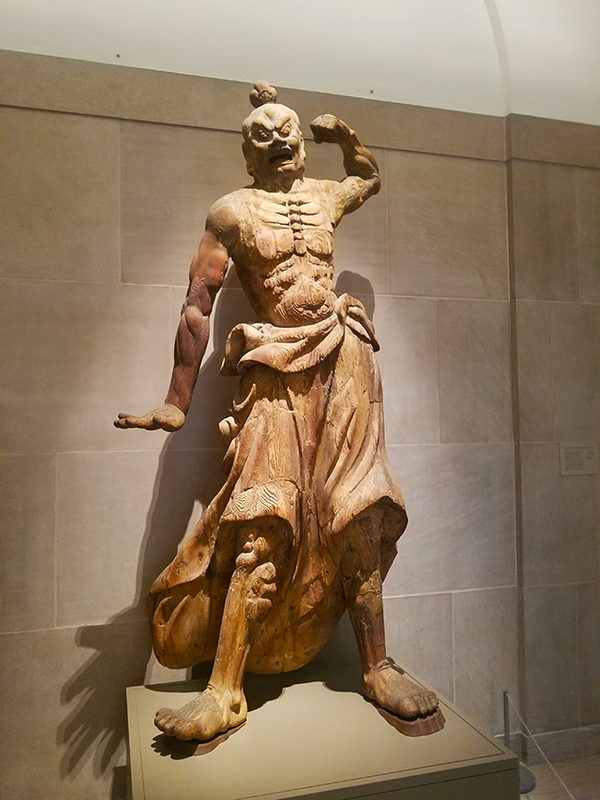 The Freer Gallery, The Sackler Museum and the Museum of African Art share a sprawling underground space which shows off their tremendous collections of Asian and African art. There is so much to see there that in our time there we barely scratched the surface. Maybe next time. One of my personal favorites were these two large wooden sculptures. Created about 8-900 years ago, they once flanked the entrance of a Buddhist temple in Osaka, Japan. They were known as the Protectors of the Buddhist Universe. The one shown here at the top has an open mouth which represents the ah sound which is the first sound in the ancient Sanskrit language in which Buddhism was born. The other has a closed mouth which is the om which is the final sound. These guardians are meant to protect the Buddha and his followers from beginning to end. They are the alpha and the omega. 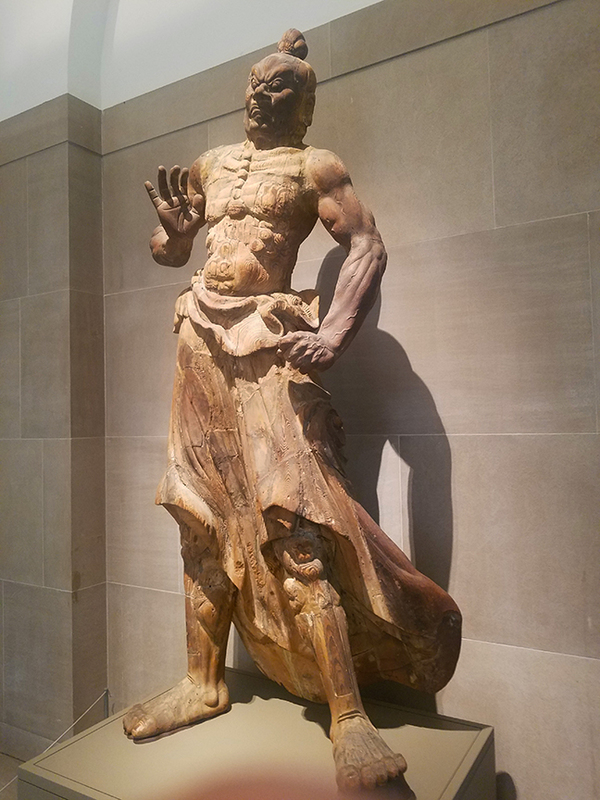 As I said, there is a wealth of art and history there so if you get a chance, definitely take the time to visit this gem that seems overlooked in the Smithsonian universe.